Sorry, it’s been a while! My schedule has been way hectic between homework and classes, assignments, writing jobs, spring break and my internship search, and unfortunately, this blog sort of got cast aside for the time being. But, fear not! Because, I’m back! And hopefully with regularly scheduled posts! Yay! And since tonight is the pinnacle of fashion events for the year, I thought I’d post my red carpet review. This year the theme is Manus X Machina (aka the intersection of fashion and technology) and I know visiting the exhibit will be on the top of my NYC plans this summer for sure. Here’s Vogue’s exclusive peek at the exhibit. Can you say gorge?? Co-chair Taylor Swift in Louis Vuitton: love it! I haven’t been the biggest fan of her new platinum ‘do, but here, it’s growing on me as it perfectly matches the vibe of her edgy dress… and THOSE SHOES. Love Karlie Kloss’ cape over the dress. Super sophisticated, but as soon as she removed the cape, it becomes a super sleek, tailored dress with cutouts galore. Stunning. And for the after party, Brandon Maxwell literally just cut off the bottom half– and it still looked just as amazing. Heartthrob status on Nick Jonas. That is all. Rose Byrne gives Old Hollywood glam here and I’m digging its vibe from the classic silhouette, and simple hairstyle. Selena Gomez in Louis Vuitton just doesn’t work for me. 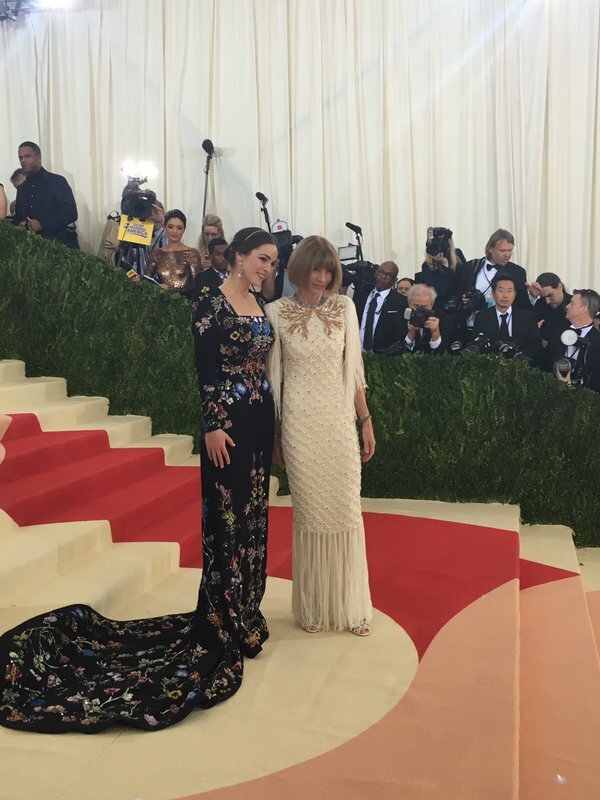 One, it looks a little too informal for this famous gala. Two, it more closely resembles the punk theme a few years ago. And three, the other Louis girls have way better gowns tonight. Chloe Grace Moretz stuns in this gown. I’m obsessed. More than that, I want it. That is all. Hair, markup, wardrobe is pure perfection on the teen. From Selena Gomez’s bridal gown from last year, Vera Wang has taken a page from past Gala hits for Rita Ora this year. I just feel like it’s too much of a repeat from prior years, but it is impeccably tailored. Saoirse Ronan has gone— I don’t even know how to explain this. Yes, it’s high fashion, but does it have too much going on, I wonder? Between the feathers, the brooch, the collar– I wonder if it’s all too much together. Like a high fashion version of the Hamilton ensemble outfit. Is SJP trying to predict Tony noms for the show??? (which are announced tomorrow morning) But seriously, all I see HAMILTON. Someone please back me up– right??? Kendall Jenner: the one Kardashian-Jenner sister with a bonafide career and she has the worst dress of her sisters… How did her sisters who are only really known for their E! show and social media get gorgeous custom Balmain gowns?? I just don’t understand. Hailey Baldwin looks like a glittery referee with Angelina Jolie’s leg slit, and I’m not feeling the look. Last year, I loved her Topshop mini, but she’s gone downhill this year. Kylie Jenner: congrats on being the best dressed Kardashian-Jenner sister at the gala! Her Balmain gown is impeccable and the bob shows a simplistic elegance that we’ve never seen on Kylie– but it looks ahmazing: welcome to the #BalmainArmy, Kylie. Love Demi Lovato’s black, gold and silver sequined gown with the slicked-back bob. Looks so chic. Zoe Saldana’s TRAIN, oh my gosh! Truly stunning. The showstopper of the night for sure! 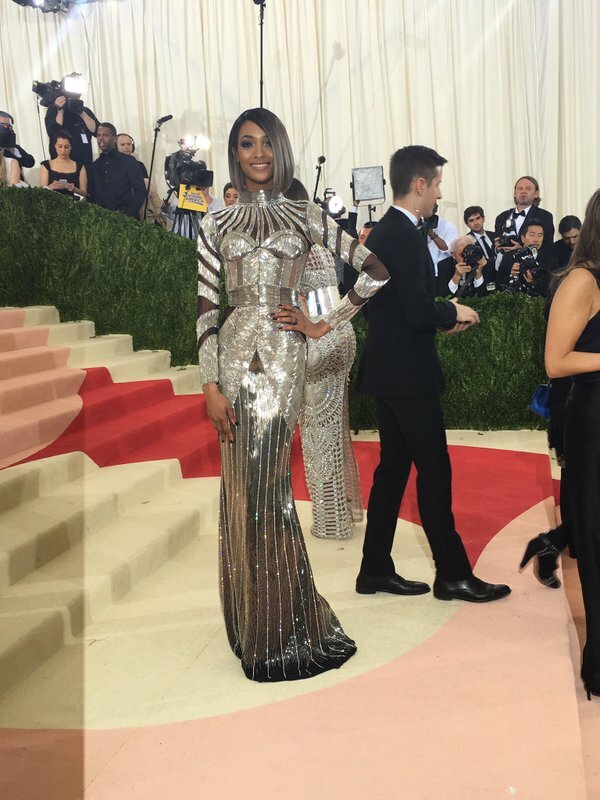 Jourdan Dunn: love her Balmain gown and her highlighted bob! Luptia N’yongo looks like a Disney princess in the emerald Calvin Klein gown! Gorge. Wow, love Karolina Kurkova’s Marchesa gown! Truly stunning. High fashion it couple alert? Congrats to Zayn on his first Met Gala and I’m kind of digging the cool, edgy vibe of the “robot” arm thing? It looks super haute couture. He looks like a badass in Versace. But, Gigi decided to play it really safe and matronly– in other words, boring. I’m sorry, she’s 21: you should be taking fashion risks, like your boyfriend. Matching baby bumps for Emily Blunt and Olivia Wilde! Both beautiful gowns, but meh, not very exciting. Beyonce in Givenchy wins. Per usual, Givenchy knows how to create a showstopping gown and so does Mrs. Carter. I don’t care it’s it’s Kanye West– you don’t wear RIPPED JEANS and denim jacket to the MET GALA. Are you crazy, Kanye? And Kim’s look is too… blah, not a fan. I sort of like Kate Hudson’s gown? It’s very high fashion, yes, but I think it’s a little to many weird cutouts and pieces hanging off that take it to a level that I’m not a huge fan of… And the shape and color is reading bridal to me? Blake Lively is normally one of my style icons who can do no wrong as is Burberry, but this is just…. eh…. 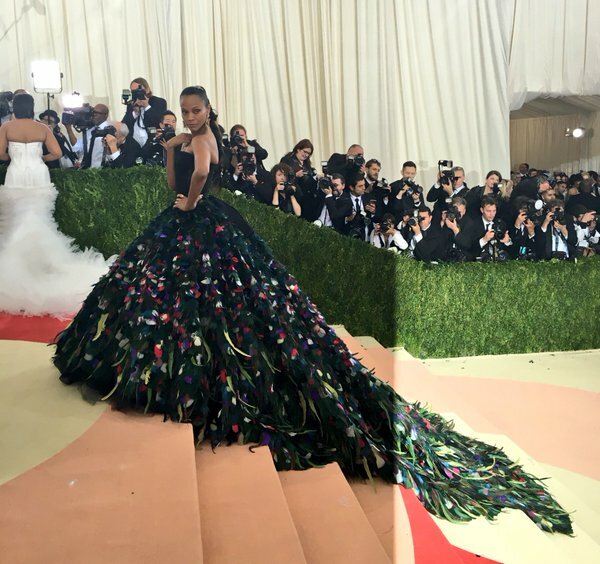 I don’t like how the photographers captured the train tulle thing. From other angles, it looks so elegant, but here it looks like way too much. But, great, sleek hair, makeup and earrings. How iconic for Marc Jacobs to walk the carpet with Bette Midler?? Legend. And he did a great job with her couture dress and headpiece. Overall, some good, some bad, some meh– but all in all, there was no shortage of high fashion, which is just as I like it. Those are some of my thoughts! Check out all the arrivals on Vogue for more fashion goodness.